You can follow Paul on Twitter here. My name is Paul Schrijver (27 years old). I live and work in Zwolle (The Netherlands) for PEC Zwolle, a club that plays in a division called the 'Eredivisie', which is the highest division in our country. My work involved doing the communication for the club. How long have you been a fan of Málaga and what made you support them in the first place? This goes way back. When I was younger I played FM98 (Football Masters) and FIFA - I always choose Málaga as the team to play with. But my real love for the club came in 2014. Every year we go with PEC Zwolle in the winter stage in Mijas near Málaga. So La Rosaleda was not far from the hotel. My first live game was on the 4th of January, 2014, which was Málaga CF vs Atlético Madrid (0-1, Koke scored). But a year later, on the 6th of January, 2015 I saw my first win - against Levante (2-0) in the Copa del Rey. It was great with the Frente Bokerón! Ever since I've tried to see a live match from Málaga every winter. Describe your first experience of watching Málaga play? The La Bombonera hymn! I sang it with the Malaguistas! In Spain I like the hymns from Málaga and Real Betis Balompié the most. Paul actually vlogged that part - you can watch it by clicking here. To an outsider - how would you describe Málaga's playing style, what it means to be a fan of the club, and what it means to be a player of the club? This year I took the stadium tour. It is an honor to be a fan in such a beautiful stadium. The playing style? A little bit Dutch but the defense is different. Many Dutch people have played in Málaga: Kiki Musampa, Ruud van Nistelrooy, Joris Mathijsen, Nordin Amrabat and Adnane Tighadouini two years ago. Describe the importance and significance of a game against a rival such as Sevilla? 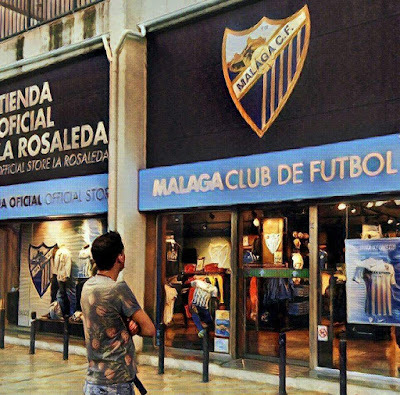 What do you think would be the key differences between a Málaga fan and a fan of those clubs? I have never seen the derby against Sevilla, but a Málaga fan told met that they hate Sevilla. I don’t know if Sevilla also hates Málaga. Of course, Sevilla also has the derby against Betis. The 4-2 win last season was very nice. There was a time when Málaga was inconsistent in establishing themselves in La Liga. However, in the past few years it has consolidated itself around the mid-table places. How would you describe the last few seasons for Málaga fans? Last year was not a good year, but sometimes you must be satisfied with enforcement in the division. Being in La Liga is always better than Segunda Division. They should not be allowed to go there anymore. In the Champions League, when Málaga played against Porto and Borussia Dortmund (argh!) was one big adventure, but that was the zenith. Málaga has to go for the left ridge this season. This winter I saw a Málaga youth team play. The team was very good - too good for the division. I like it when clubs pick up players from the youth teams, like we do in Zwolle. One thing I can not understand. Why did Ochoa leave? In my opinion he was a great keeper. During the World Cup 2014 he was great with Mexico against the Netherlands. Another thing I like are the shirts of Málaga. Every year they are beautiful, so every winter I go to the "Tienda Official" (official club shop). The most famous ultra group at Málaga is the Frente Bokerón. How would you describe them and their political affiliations? What is the feeling of fans of Málaga and of other clubs towards them? How would you characterize the Málaga board's support to them? It was so great to be there one time. In my opinion it is a big ultra group. I think the atmosphere is fantastic. The experience of the game of football is much more intense than in the Netherlands. I think Málaga's coming season will not be a problem and will be a good ninth place. My favorite player is one of most Málaga fans. Not Ruud van Nistelrooy, but Roque Santa Cruz.